There’s something pathetically froggy about spatchcocked poussins but my word, they taste good and they cook a lot faster, staying deliciously juicy. They make a fabulous supper and a very good dinner party dish. Minimum effort, maximum flavour. I’ve cooked them here with sweet/sour pomegranate molasses and they beg to be picked up and torn apart in a regrettably impolite manner. Finger bowls come in handy. One poussin will, at a pinch, serve two. I like the generosity of a whole bird but split them lengthways when you serve, if you prefer, so each person has a breast, a leg and a wing. If, on the other hand, you’re cooking more than two poussins, increase the quantities of the marinade ingredients accordingly. You might like them with a rice or bulgur wheat pilaf and a side salad. Turn the birds over and press down on the breast bone to flatten them out. Mix together the marinade ingredients, all except the salt and pepper, and massage into the poussins to coat. Put in a roasting dish, cover with clingfilm, and refrigerate for at least an hour and up to 24 hours. Pre-heat the oven to 190C/375F/Gas Mark 5, drizzle the poussins with a little oil and grind over some salt and pepper. Roast uncovered for 40-45 minutes, basting after 30 minutes, until the juices run clear when you poke the thickest part of the meat with a knife. While they’re cooking, prepare your pomegranate. You can buy the seeds ready-prepped but if you have a whole fruit, you might like to check out this method for extracting the seeds without also getting bits of the bitter pith. It’s quite therapeutic. Alternatively, cut them in half, hold the halves over a bowl, and whack hard with a wooden spoon. It works for Jamie Oliver. 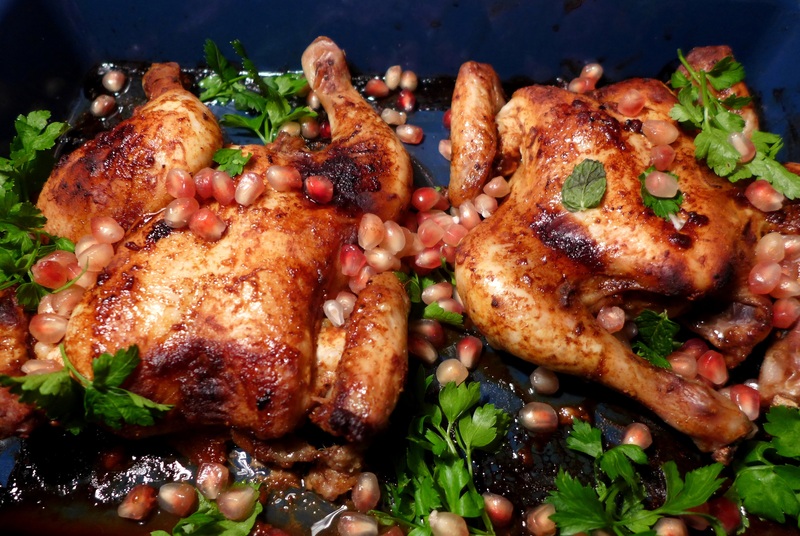 When the birds are done, remove them from the oven, baste again and rest for 10 minutes before garnishing with pomegranate seeds and herbs. 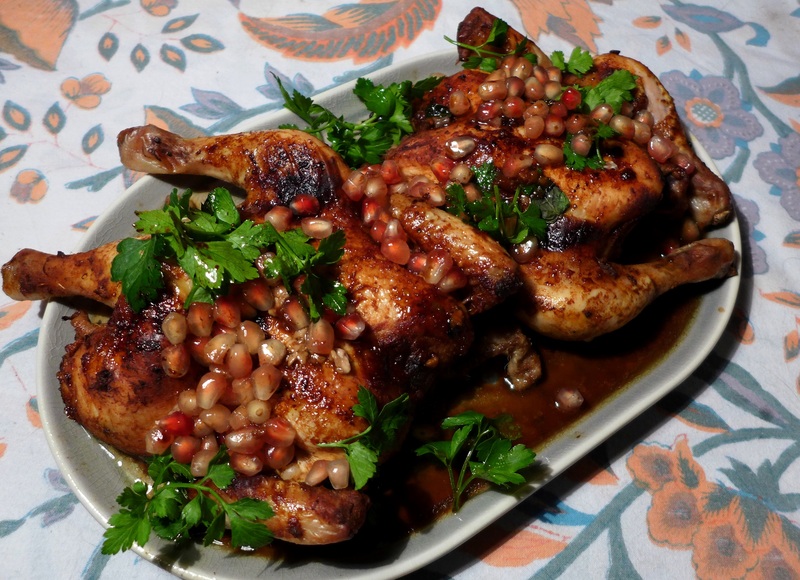 This entry was posted in Chicken and other poultry, Mains and tagged dinner party dishes, dinner party recipes, pomegranate poussins, poussins with pomegranate molasses, quick suppers by Linda Duffin. Bookmark the permalink. A lovely dish to look at and tasty I’m thinking as well. I’ve just recently discovered pomegranate molasses and love its flavor so this is right up my ally. Thanks for a great recipe. What on earth is wrong with something being ‘froggy’ 🙂 ? Have never used pomegranate molasses and ras el hanout together . . . . that will be fun trying !!! Erm…maybe not everyone likes frogs’ legs? 😀 Thanks for stopping by, Eha, have a great weekend. Tell’ya a true story from way back: Place Fiji . . . the ‘Fijian’ . . . spring school holidays when a whole lot of parents from the same Sydney school decided to have dinner together in the hotel garden restaurant: about ten pretty small kids to accommodate – so two tables: them and us! Our younger daughter was about 5 and already a huge ‘foodie;’ or so she thought 🙂 ! ‘May I have a helping of escargots followed by the frogs’ legs: please add a salad or Mom will be very grouchy!’ Oh the poor native waiters did check since the whole table did decide to try and absolutely loved both dishes – did not think so much of the composition of the meal but Maccas: bye-bye:) !! They’re beautiful! The tomato puree surprised me. Great recipe! Absolutely excellent. They need a bit of punch added and the pomegranate does the job. Lovely colours too.